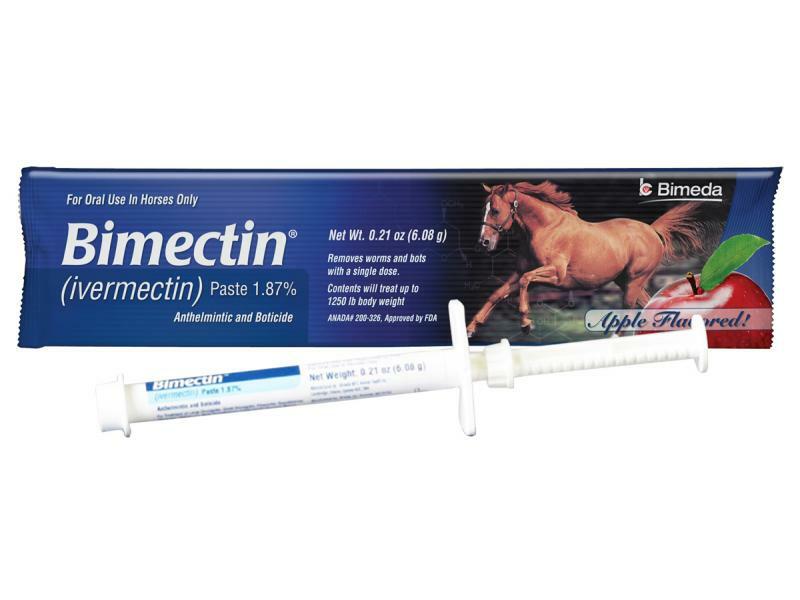 Developed for the rapid treatment of a wide range of parasitic infestations in horses and ponies, apple flavoured Bimectin is a ready-to-use oral paste with an Ivermectin PhEur of 18.7mg per gram strength. This formulation is ideal for the control of both small and large Redworms, adult and larval Pinworms, Lungworms, Stomach Worms, Ascarids, Intestinal Threadworms, Bots and Cutaneous Worms. One 5.42g syringe contains enough paste for one 600kg horse. Safe for foals and lactating mares throughout pregnancy. Numerous spp. - adults and effective against the immature (fourth larval) stages. Ivermectin is not effective against the encysted larval stages of small strongyles. Parascaris equorum - adults, third and fourth stage larvae. G. haemorrhoidalis - oral and gastric stages. The list contains the more important endoparasite species. This anthelmintic may also be effective against other species. For more information consult your veterinarian. Administer Bimectin orally as a single dose rate to horses at the recommended dose level of 0.2mg ivermectin per kg of bodyweight. Each syringe delivers 120mg Ivermectin, sufficient to treat 600kg of bodyweight. Single administration. Bodyweight and dosage should be accurately determined prior to treatment. Dosing instructions: Each weight marking on the syringe plunger will deliver sufficient paste to treat 100kg bodyweight. Unlock the knurled ring by making ¼ turn and slide the knurled ring up the plunger shaft so that the side nearest the barrel is at the prescribed weight marking. Turn the knurled ring ¼ turn to lock in place. Make sure the horse’s mouth contains no feed. Remove the plastic cap from the tip of the nozzle. Insert the syringe into the horse’s mouth at the interdental space. Advance the plunger as far as it will go, depositing the medication on the base of the tongue. Immediately raise the horse’s head for a few seconds after dosing. Always read the insructions before use. Withdrawal period: Horsemeat and offal withdrawal period: 34 days. Not permitted for use in mares producing milk for human consumption. Special precautions for use in animals: Some horses carrying heavy infection of Onchocerca microfilaria have experienced oedema and pruritus following dosing, assumed to be the result of death of large numbers of microfilariae. These signs resolve within a few days but symptomatic treatment may be advisable. The product has been formulated specifically for use in horses only. Dogs and cats may be adversely affected by the concentration of ivermectin in this product if they are allowed to ingest spilled paste or have access to used syringes. As Ivermectin is extremely dangerous to fish and aquatic life treated animals should not have direct access to surface waters and ditches during treatment. Parasite resistance to any particular class of anthehelminthic may develop following frequent, repeated use of an anthehelminthic of that class. Use during pregnancy and lactation: Horses of all ages, including pregnant mares and breeding stallions, have been treated with no adverse effect. When administering to lactating females, residues of ivermectin could be present in the maternal milk, since no studies have been reported on the development of new born horses of the ingestion of this milk, it would be prudent not to feed very young animals with milk obtained from the mother. Handling the product: Do not eat, drink or smoke while handling the product. Avoid contact with skin and eyes. If accidental skin contact occurs, wash the affected area immediately with soap and water. If accidental eye exposure occurs, flush the eyes immediately with water and, if necessary, get medical attention. EXREMELY DANGEROUS TO FISH AND AQUATIC LIFE. Do not contaminate surface waters or ditches with product or used containers. Following intensive exposure to sunlight, photolytic degradation of ivermectin may occur. No known interaction with other medicaments. Below are some recent questions we've received regarding Bimectin Horse Wormer (Apple Flavour), including answers from our team. Is this possible to use alongside equimax to kill bots? Both of these products contain the ingredient Ivermectin and both are effective against bots (Gasterophilus Intestinalis) so you should only need to use one or the other. This wormer can be used safely in pregnant or lactating mares. As always, you should try and give an accurate dose based on the weight of the horse, to ensure the dose is both effective and safe. I have just wormed with Equest pramox, I have found that my horse has pinworm, is it safe to use Bimectin so soon after? Pinworms can be difficult to control. The Equest you have used should have some activity against them, so you might find they gradually go anyway. If not then Bimectin might be effective. Some vets recommend a double dose of Pyratape for pinwomrs. Personally I would prefer not to give another worm dose just yet. Are the pinworms causing trouble? Where did they come from? Are other hoses affected? Ideally all horses at your yard should be treated for pinworms at the same time to try and achieve better control.